Ideal for spaces up to 800 sq.ft. 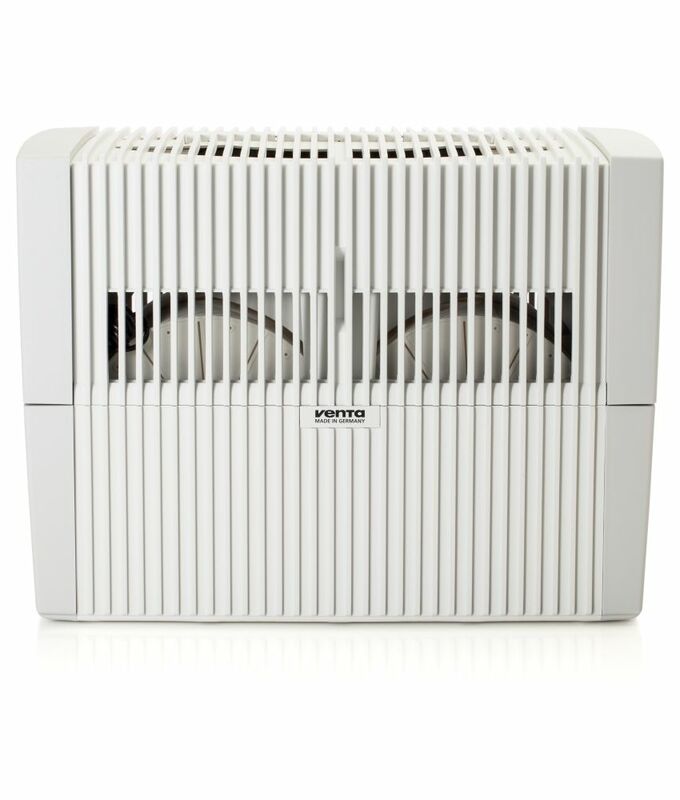 2-in-1 Evaporative Humidifier + Air Purifier is rated 4.6 out of 5 by 8. Rated 5 out of 5 by Creamy from Service great! I bought it 1month ago, very good! I am satisfied it. Rated 5 out of 5 by Sonya123 from Great Unit!!! I would highly recommend this unit. Doesn't put more humidity in the air then normal and washes the air. Rated 3 out of 5 by Charles from On the Fence I purchased the Venta LW45W for my mother's very dry condo. Ideally, I'd have liked a humidifier that would humidify most, if not all, of her condo. Having purchased a $200 humidifier of another brand, only to find that it was badly designed and badly made, I tested the Venta prior to giving it to my mother. At my home, with a furnace-attached humidifier, I found that the Venta evaporated almost no water. It was unable to increase the humidity even in a small room any appreciable amount beyond the 40% it already was. While I appreciated that the Venta had no filters to throw out (landfill) and replace, I found that even on the lowest fan setting it was not silent. Quiet, yes, much quieter than most humidifiers, but not silent, making it difficult for me to sleep with it in the same room. I think that the Venta is well designed and made - much, much better than the $200 unit I purchased and returned. However, at more than twice the price, it should be. That the unit has no explicit method of controlling and maintaining humidity - it runs continuously at whatever speed you set it, rather than having a humidity set point and turning off if/when it achieves that - is a negative. Largely, it is designed to be an expensive air cleaner that humidifies. As an air cleaner, one would like it running most/all of the time. Since there is not obvious debris trapped by the Venta, it isn't clear just how much air cleaning it does. One independent industry review suggested that it was very ineffective as an air cleaner. For many who purchased a Venta, there seems to be an element of "I spent this much, it has to be great". Anyway, with mixed results, I took it to my mother's condo. There, she found that it did raise the humidity in her medium-sized bedroom (about 200 square feet) if set on the middle fan speed. It was unable to effectively raise the humidity in surrounding rooms, no where near the rated square footage the Venta's specifications state. It is unclear how well it cleaned the air and did not remove very strong odours in her bedroom. Reading other internet reviews from other owners, many are happy with their units. Many claim great humidification, others claim the air cleaning has eliminated various health problems and prevented flus and colds. My experience has been that the Venta is a very expensive unit, nicely designed and manufactured, but it is not a particularly effective humidifier and might not be a particularly effective air cleaner. Many people who have purchased Venta units, buy one for each room. In short, I'm still on the fence about whether or not the Venta is worth the $500 price tag and the effectiveness one gets for that price. Rated 5 out of 5 by Sandy from Great!! No white dust. Good humidity. Quiet. Easy refill. Great!! No white dust. Good humidity. Quiet. Easy refill. Rated 5 out of 5 by Sami from As good as it gets. I bought 2 machines about a month ago after a long search for an air purifier. And I really researched a lot. I am a strong believer in water purification, and no Hepa filter can match. I also thought about Dyson, but at a $100 for a filter change, I did not see the point. Upon delivery, one of the machines had a broken door. No biggie. Returned it hassle-free and ordered another one. The bonus with this machine is the fact that you get a natural humidifier as well. I know it works because on dry days, the tank only lasts around 24 hours, and on normal days it can last 48. That is on the second speed setting, which I find to be the best. The first setting is too low and on the third setting you start hearing the fan. I would only consider the biggest model as you would have to add water more often with the smaller versions. I also bought the scented oils but would not recommend them. They do not last very long. Im using the plug-in types instead, which work great. The machine is super sturdy, the mechanism is super simple, which means that it could last a very, very long time, making it a great value for money. Reasons not to buy: 1- If you need to have a purifier running 24/7 while no one is home for more than two days, this will not work for you. 2- If you find filling the tank a chore, this will not work for you. Other than that, go for it! Buy the big one! Rated 5 out of 5 by AIR10 from I really like this humidifier. We live in a very dry climate so I have humidifiers going all winter. I now have two of this make and they are the best I have used. Easy to fill and clean and they really make a difference to the rooms they are in. Rated 5 out of 5 by Stu from Love it Winter or summer ,This is my second one and if you care about your lungs,,sinus, throat t... Love it Winter or summer ,This is my second one and if you care about your lungs,,sinus, throat tissue long term ,Its a wonderful product . Do the 2-in-1 Evaporative Humidifier + Air Purifier require filters? If so, how much do replacement filters cost (estimate)?